Holding running races at 9am or earlier on a Sunday, has become such an established tradition over the years, that we no longer question whether or not it would be better all round if we actually challenged the status quo and attempted to put on races at a more convenient time. If you were asked when would you prefer to run your race, you’d probably opt for a late morning or early afternoon race, and probably on Saturday rather than Sunday so that you could relax afterwards, enjoy a Saturday evening celebrating, followed by a Sunday morning lying in bed basking in the sweet exhausted satisfaction of a hard job done and out of the way. How many would choose as their first choice, the crack of dawn on a Sunday morning. Some, but not many. In this regard, there is no other sport that acts less in the interests of its participants than running. So why are races always on Sunday mornings? Well it’s a stupid question, isn’t it? Everyone knows that. It’s so as not to inconvenience the motorist or the Sunday shopper. Ah yes, the motorist. The arch enemy of the runner. Road races are run on roads, so it’s either thus or them. We can’t possibly co-exist, so the concerns of the motorist must take priority. In fact, if it was up to them, they’d have us running our races at 3am on minor roads out in the sticks. You know what? This is rubbish. There is a perfectly simple solution to this. Split roads or use of pavements. And if the road must be closed for a brief time, then the motorist will cope. Does London grind to a traffic clogging halt during the marathon every April? Of course it doesn’t. With a bit of pre-warning, and effective diversions and marshalling, the motorist manages to avoid the race and copes pretty well, thank you very much. Yes there will always be a few grumbles, but the vocal minority shouldn’t be allowed to ruin the fun of the overwhelming majority. So what about the Sunday shopper? Why are they held in such regard? The Liverpool marathon was stopped a couple of years ago, nominally because it disrupted the Sunday shopper. The Kingston marathon went the same way because the finish of the marathon clashed with the busy Sunday trading period around lunchtime. Why the two should be mutually exclusive has never been satisfactorily explained. Who on earth says, “I can’t possibly pop into M&S for a pair of pants, because there’s a load of sweaty lycra-clad balding middle aged men shuffling past the town hall.”? Surely, per capita, the runner spends more money in the town during a race weekend anyway. Along with supporters and family, they will probably spend money on parking, dining, drinks, and possibly accommodation too. Any councillor with a calculator should be able to work out the positive effect of their town hosting a mass participation event, and as such do all they can to bend over backwards to encourage them to take part, at the minimum of inconvenience. The UK is almost unique in how it has marginalised running as a sport, too often seeing it at best as an inconvenience and at worst an embarrassment. 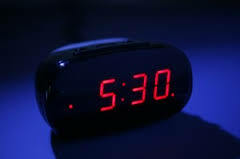 So would hosting races on a time other than early Sunday morning work? Well parkrun manages almost 100,000 runners every week on a Saturday, so you can’t deny that there is an appetite amongst people to run on a Saturday. But they are off-road, so let’s look overseas. 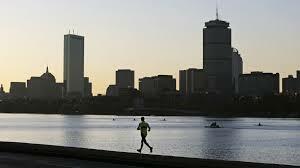 The Boston marathon has been running on a holiday Monday for a hundred years. 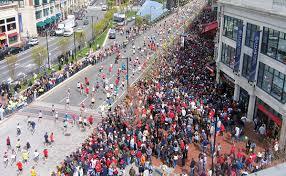 Bostonians love it (runners, motorists, shoppers alike) and the city embraces it and turns it into a 26.2 mile party. Everyone gets involved and everyone benefits. The Stockholm marathon has been run on a Saturday afternoon forever, and you know what? It works. Brilliantly. The city again embraces it. The organisers and the city tourist authorities realise that to advertise their city and get the maximum income from the overseas participant, a Saturday race means that people are more likely to come for a full weekend, stay two nights and spend twice as much, with the race on Saturday followed by a full night out celebrating in the bars and restaurants, and a day of sightseeing and being a tourist before heading home later on the Sunday. Even with Sunday races overseas, most cities realise the benefit of putting the race first, running the route through all the main tourist hotspots in the city centre, inviting the public to support and to become part of the event. It means people flood into the cities to run, cheer or just to watch in quiet appreciation, spending their money in the bars, cafes, hotels and car park ticket machines alike. It’s a great way for towns and cities to make everyone happy. A model that works well from Amsterdam to Florence, from Paris to Barcelona. Compare to the UK, where the London marathon has proved that the model can work over here by inviting everyone along to the party. So why does the UK marathon get pushed out into the suburbs and countryside to keep it away from our precious motorist and shopper? The York marathon only spends a couple of miles in York before sending everyone out to empty supporter-free country roads for a few hours. 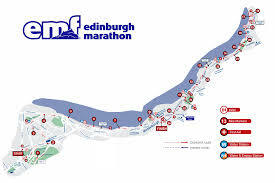 The Edinburgh marathon is the worst culprit, and probably should be sued under the trades description act such is its flimsy connection to the actual city of Edinburgh. A race that used to start along Princes Street and take in much of city centre, before finishing in the wonderfully convenient and spacious Holyrood Park, is now shoved out to the East Lothian coast where the hardest part of the event is making the 8 mile journey back to the city after the finish line. If you were in Edinburgh at the time, there is absolutely nothing to suggest that there is even a marathon going on. A massive oversight and missed opportunity by the city authorities. But hey, the roads aren’t obstructed and the motorist can drive to the shops unencumbered by pesky runners. Councils need to look at the broader economic benefits of big events being held in their towns and cities, and not charge race organisers prohibitive rates for road closures, coupled with demands for everything to be cleared away by Sunday mid-morning. Big events act as shop windows and magnets for all of a towns attractions. By insisting on staging them at a time when it’s most inconvenient to almost everyone, including the organisers who have to start work in the early hours of Sunday mornings, it doesn’t really benefit anyone. It’s a Sunday morning because that’s when most people have free time and in the days when races were not full getting as many people as possible was/is key. Therefore Sundays remain historically favourite for organisers. An insightful and well written piece. I would certainly favour a lunchtime start on a Saturday and would probably enter more races if they were held at more social times. I definitely think race organisers – and the sport as a whole – are missing a trick. I would be far less likely to race regularly on a Saturday as I am self employed, and my clients prefer me to be available on Saturdays rather than Sundays. As far as later in the day is concerned, earlier is better due to issues with heat for half the year. I ran the St Albans half marathon in the sweltering heat last year, and that was a fairly early start, it would have been a nightmare a couple of hours later. I ran the Ealing half (early start) last year and apparently it was hot, I know people who ran the Windsor half (with an early afternoon start) on the same day who suffered in the heat with the later start. I was thinking of running Windsor until I knew about the late start time. Apart from the issues with heat in summer and early autumn, starting races later would mean that runners would get stuck in traffic congestion and transport problems so wouldn’t make it to the start of the race on time. I have dropped another runner of at the Windsor Half Marathon and if it wasn’t for the fact I was driving she wouldn’t have made it to the start of the race in time due to traffic congestion.